Back in August Mr. Paul Box penned “How Much Difference Does Ballistic Coefficient Make” on ballistic coefficient (BC) and its use in the hunting world and the limited amount of bullet drop and wind drift that occurs with bullets that have a large difference in BC at ranges of 200 yards and less. In that referenced situation, the differences in bullet impact will not cause major issues in a hunting environment. As an addition to this information, I would like to propose a scenario where the difference in BC definitely does come into play and where BC is considered first during bullet selection. In the world of competitive match shooting, there are midrange matches (usually 300 to 600 yards distance) and long-range matches (1000 is most common with many up to 1200 yards), there are also ELR (Extreme Long Range) which are still evolving as to the distance they are being shot at. These matches are usually scored via group size, scoring rings, or a combination of both. In either scenario of group size or scoring rings the efficiency of the bullet (BC) is paramount to minimize the amount the wind affects the bullet impact. Shooters look towards the higher BC bullet for a given caliber and weight during their selection for this reason. If a bullet with a lower BC is chosen, the competitor will find that when a wind switch or gust is not seen or is ignored the shot will land much farther from the group or X-ring than a shot that is taken with the same criteria but a higher BC bullet. When shooting at distance and the unforgiving scoring rings on a Hi-Power or F-Class target this difference amounts to points and with the level of competition that is out there you cannot afford to give up the BC. In benchrest shooting group size is just as crucial. You will notice below two bullets that are similar that Sierra offers, one is our world renowned 30 caliber 168 grain MatchKing #2200, the other is a newer version of this bullet with some improvements to make it much more efficient. 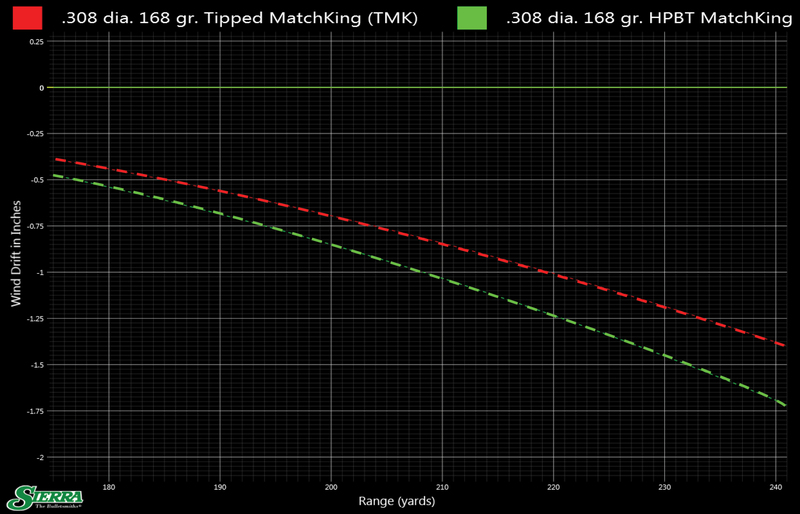 You will see this efficiency in the amount of wind drift and thus smaller groups and higher scores in matches. If you notice bullet offerings from Sierra is much larger than in the past due to the need for choices by the shooters. Most of the newer selection of bullets have a higher BC than the old standby designs of similar weight for the caliber. Keep an eye on Sierra as we are constantly monitoring the needs of the shooters and developing new bullets for those needs. This entry was posted in Uncategorized and tagged ballistic coefficient, Ballistic Software, Infinity 7, MatchKings, Tipped MatchKing. Bookmark the permalink. There are several comments on the web that Sierra’s HPMK bullets in 168 and 180 grain weights have boattail designs that cause stability problems at both short and long ranges. The boattail on 175, 190 and other weights have less angle and are better for bullet stability. What accuracy level do these bullets shoot in your 200 yard range when tested for quality? I ask because I was a good friend of Martin Hull back in the 60’s and 70’s and toured the California plant a time or two with him. He showed me some of the 10-shot test groups of the 168 and 190 grain bullets that were under 2/10ths inch and a few smaller ones. These were fired in their 100 yard range. Thank you for commenting and for mentioning your friend Mr. Hull. I was not fortunate enough to have met Mr. Hull although I have been able to follow in his footsteps and can see the effects of his work here at Sierra. 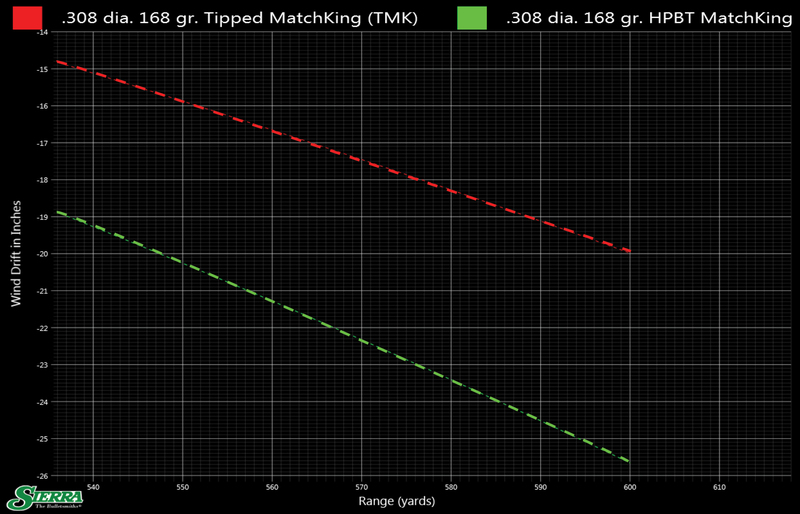 We shoot to consistent 1/2 minute of angle accuracy or better when evaluating our Matchkings. It is very seldom that we have an issue maintaining the accuracy requirement, and on the odd occasion we isolate and fix the issue. Thank you for sharing your friendship with Martin Hull with us!